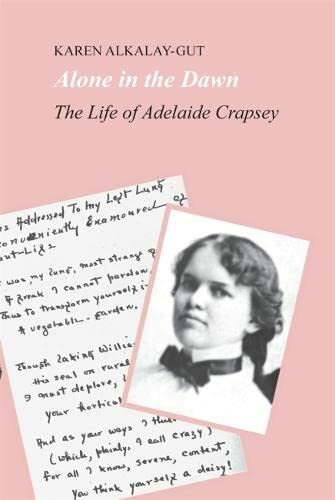 Alone in the Dawn is the first full-length study of life and work of Adelaide Crapsey, an American poet who lived at the same time and often in the same places as Gertrude Stein, H.D. (Hilda Doolittle), Ezra Pound, W.B. Yeats, and Virginia Woolf, but whose artistic goals were antithetical to those of her literary contemporaries. Dedicated to understanding the scientific basis of literature, Crapsey invented the cinquain, a poetic form based on principles of stress and meter, and conducted an intensive critical study of prosody. Placing Crapsey's work within its critical and historical context, Karen Alkalay-Gut's biography presents an inventive poet who worked outside the mainstream of twentieth-century poetry. The daughter of an Episcopal priest, Crapsey was raised in a liberal environment that encouraged great expectations for women. She excelled in her studies at a private girls' school in Wisconsin and then at Vassar College. Described as a bewitching, wraithlike figure, Crapsey captivated teachers and peers alike with her innocence, wit, and mischievous irreverence, seeming to embody the very ideal of the 1900s "new woman." Her college roommate, novelist Jean Webster, later used Crapsey as a model for some of the progressive and spirited female protagonists in her fiction. Crapsey never fulfilled the promise of her early success. Before succumbing to tuberculosis at age thirty-six, she had to sacrifice years of her life in search of health rather than the pursuit of truth. Her completion of a major article on her research and interpretation of metrics was followed by a devastating physical collapse. In a last, desperate attempt to find a cure, Crapsey was sent to a famous sanatorium at Saranac Lake in upper New York state. Though required to remain immobile and completely isolated, she managed, in the months before her death, to collect her poems in a volume she called her "funeral urn." When Crapsey's posthumous book of selected poems appeared in 1914, readers were unable to separate the work from her death, associating Crapsey with the popular literary stereotype of the beautiful young writer consumed by her fiery artist's soul. Yet Crapsey's life was not romantic drama but a grim, never-ending encounter with illness, grief, and impecunity, a losing struggle between ambition and death. In Alone in the Dawn, Alkalay-Gut reveals within the lines of Crapsey's poetry the tragic, truncated eloquence of her life. KAREN ALKALAY-GUT is professor in the English Department at Tel Aviv University. She is the author of Open Secret: Poetry and Popular Culture, and has published over twenty books of poetry.